Is there any glamour to be found in breeding cats? No, no glamour, but there are joys to it. For one, you get to deal with the breed of cat you love. You become more than just a pet parent; you become an expert on the breed. You learn everything there is to know about them. You also get a chance to raise kittens again! Even though your kitten is now a cat, you’ll have the opportunity to have kittens around the house. Who wouldn’t love to have a life surrounded by kittens? Now the truth about becoming a cat breeder. You will notice that I didn’t mention how much money you can make in breeding cats. The brutal truth is that you shouldn’t get into breeding cats as an income. There is a lot of expense and risk in it, so you should only do it as a passion for the breed. When I was thinking about breeding Minuets, I did a lot of research on it and the first thing I heard was that it costs a lot. I figured as much, but that wasn’t my motivation. I loved these cats and I wanted to be a part of promoting the breed. That should be your sole reason for becoming a breeder of any breed. As for the expense involved, it begins with the cost of the cats. Breeding cats is not like breeding dogs. You can’t just have a single breeding pair. To breed cats, you should have at least three females for every male you have to keep your boy satisfied. To do anything less could invite behavioral problems. Depending on the breed you’re interested in, setting up a breeding program could be quite expensive. Not to mention the expense of getting your cats. We had to travel to different states to pick up each of our cats. When looking for your breeders, you don’t want to limit your search to a local region. You should be interested in the best cats out there to perpetuate their lines. If that means you have to fly across the country to get one, it’s all part of the expense. Another expense you shouldn’t disregard is vet bills. Your adult cats will need to be vetted regularly and receive their shots. A cat’s health is unfortunately often overlooked by their owner, while dogs are generally taken to the vet every year. This isn’t necessarily done intentionally by the owner. It’s mostly because cats stay indoors and don’t seem to need regular medical attention. But they should still receive their shots and be vaccinated against rabies regardless of where they live. As for a breeder, your cats will need their yearly exams and dental checkups to keep them healthy and happy. Your kittens will need their health exams and vaccinations. If you are sending a kitten to a buyer via the airlines, you’ll need to get a health certificate. These medical bills can add up quickly. And this isn’t even counting when your cats get sick or injured. Other expenses you can expect are the cost of quality cat food, kitty litter, toys, and other supplies. To keep your cats happy, you have to keep them entertained, and to keep them healthy, they should be fed nutritionally balanced food. You should not skimp on these factors. A happy, healthy cat will produce healthy kittens. Some of the other expenses you might incur are DNA testing, registration fees, association costs, and marketing. You should not forget that you’ll have to get word out that you have kittens who need good homes. To do that, you might have to create your own web site or advertising strategy. Add it all up and it costs a pretty penny to breed cats. Setting aside the cost of breeding cats, there is a lot of effort involved. You’ll need multiple cat litter boxes and keep them clean. At least three to begin with; a couple for your females and one for your male, since there will be times when you’ll want to keep them separate. A good rule of thumb is one litter box for each cat. You should also keep them clean. I scoop my litter boxes two times a day and change the cat litter once every week. Depending on the number of cats you have, you might have to do it more often. And speaking of cleanliness, you’ll have to keep your cattery clean at all times. This is not only to protect your cats from becoming sick, but to reduce the unpleasant smells from building up in your cattery. I vacuum up loose kitty litter, hair, and spilled food once a day and sanitize their room once a week. This takes time, of course, and dedication. No one likes cleaning but it is a necessity. We let our cats have free run of the house and we have litter boxes strategically located in different rooms, which means we clean those rooms every day. The time you spend working on your breeding program doesn’t stop with just the time you spend cleaning your cattery. Your cats will need love and attention to develop naturally. Some breeders treat their cats only as working animals, but I believe it is critical to a cat’s health and mental welfare to treat it as a pet, at least. Our cats are part of the family, just like our dogs. We integrate them into the household so they stay happy. They receive personal play time and grooming, which takes time away from yourself. But exercise is necessary. It builds your cats’ muscles and develops their agility. Breeding cats is a commitment you cannot take lightly. If you intend to become a cat breeder, you will need space. More space than if you were to breed dogs. You’ll need separate spaces for your girls and boys. Some male cats will respect a female who is not in heat but there are others that won’t. This will aggravate your females when they’re not in heat. And if they are pregnant or nursing, your females will generally not tolerate other cats around her. So space is important. You’ll need enough space to provide a safe environment for your pregnant queens to have their litters and to raise their kittens without threat from other cats or animals in the house. You’ll need to provide a quiet area so as not to cause your pregnant or nursing female anxiety. I’ve read that you can have a cattery in an apartment, provided you have the space, but I would strongly advise against it. A female cat in heat is very noisy and could be disturbing to neighbors in the next apartment. You could find yourself faced with eviction if management doesn’t appreciate the complaints. As for the noise, you’ll have to be willing to put up with it as well, regardless of where you live. Heat for a cat can last as long as seven to ten days. Their caterwauling can become annoying after a time. Then there’s the problem of having an intact male in your home. An unaltered male will become hormonal around fertile females. They can be persistent and stinky. They might develop what you consider to be behavioral problems related to dominance and natural instinct. They could start spraying in your home. There’s no way to tell what your male stud will do when he matures if you bought him as a kitten. If you’re concerned about that, you can always buy an adult male that has proven not to spray. Purchasing an adult stud can also ensure that he’s a proven breeder, since not all males are natural at breeding. As for the reality of breeding, a responsible breeder will retire their female after approximately five years of having litters. You’ll have to address the prospect of what to do with your females after five years of faithful service. Will you keep them as pets after spaying them or find them another home? You have to be able to answer that question before you acquire your first cat. And in regards to those years of faithful service, you should be realistic with how many litters your girls can produce for you. A responsible breeder will give their females adequate downtime between litters to regain their strength and to enjoy a normal pet life. I plan on breeding my girls only twice a year. For litters that generally produce only three to four kittens, that’s not a lot of income in terms of payback. Other breeds of cats may produce larger litters, but Minuets don’t produce many. That’s because the gene for the short legs is a lethal dominant gene. A lethal dominant gene means that if a kitten is conceived with two short leg genes, it will die in utero; ergo, smaller litters. Finally, you should be aware that there are heartaches involved in breeding cats. Not all litters will come to fruition. You will lose some kittens or even your female to a difficult birth. You might have a cat who delivers her kittens but then rejects them. Without the mother’s attention, a kitten’s chances of survival are greatly threatened. This brings us back to time and effort on your part. You’ll have to work hard just to keep it alive. After it’s all said and done, will you be able to part with the kittens you worked so hard to nurture along with their mother? It’s difficult letting go. You’ll have to be diligent in making sure they going to good homes, which brings us to the next obstacle to running a cattery: Finding homes for your kittens. 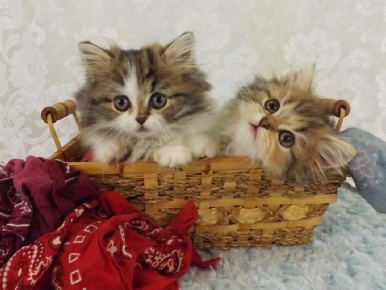 Are you prepared for the chance that no one chooses a kitten from the litter you produce? What will you do with him? You should have a clear plan in place for these types of instances. Although other breeders might have success in selling their cats, you might not be so lucky to begin with. Are you willing to shelter these unwanted kittens yourself? If you plan on dumping them off at an animal shelter, you should scrap the idea of owning a cattery right away. When you opt to become a breeder, you are taking on a huge responsibility. There is enough overpopulation of unwanted pets that we don’t need breeders adding to the problem. Have a business strategy in place to cover every situation you may encounter. With everything said, you might ask why we do this. We love these cats, pure and simple. They are remarkable creatures that give us loads of happiness. I must confess that there have been times when I’ve wanted to stop–losing an entire litter, my boy spraying, getting a kitten with a serious heart condition, and having females that won’t breed–but my husband has been my rock. He’s helped me through the heartache and kept me on course. In truth, the rewards of having kittens in the house far outweigh the misery. As for how we’re able to do it, my husband and I are retired. We have the time to dedicate to taking care of our cats, which are not any more than we can handle. In retrospect, if we were not retired, we would not be able to take on such an adventurous endeavor. I caution anyone interested in becoming a breeder to evaluate their time, budget, and inclination to keep a clean space for their cats before they jump into the business. Then be honest with yourself about your emotional level by thinking of the worst case scenario. How would it affect you? A final warning: If you feel like you’re capable of doing it, don’t do it without a mentor. Contact TICA for assistance through their mentorship program.